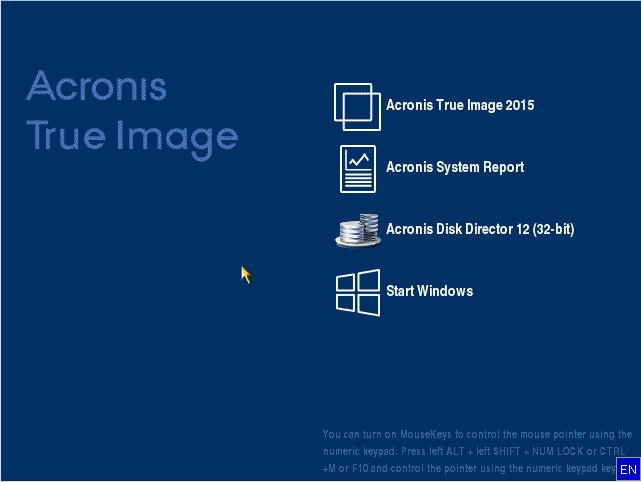 I have just now installed Acronis Disk Director 12 Build 3223, and then installed Acronis True Image 2015 Build 6525. Could someone Please help me to fix this problem? Sometimes the order of installation matters. Try reinstalling Disk Director 12. I have done as you suggested, but unfortunately still get the same error message. If your system is UEFI and you want to use the default Linux based recue media your going to have to create separate rescue media for each one. Or you can follow MVP Mustang's excellent guide in the link above to create WinPE recue media with both True Image and Disk Director. If your system is BIOS the Linux based rescue media created by True Image 2015's built in media builder will automatically include the 32bit version of Disk Director 12 after its installation. Failed to obtain system information. Message: Failed to collect system information. Acronis Disk Director 12 bootable media build can create bootable media only for Acronis Disk Director. For bootable media with True Image, please use Acronis True Image bootable media builder. Sweeties, I've got exactly the same problem. I use Acronis Drive Image & Disk Director for over 10 years. This time you got me. I bought upgrade to DI 2015 & full DD12 a while ago and did not use it for a while. Now I have found that trying to create Rescue disc with TI 2015 & DD 12 as I used to make it for 10 years does not work. I used "Acronis Bootable Media Builder" link from the open DD 12. It gives you an opportunity to use Linux-based Windows-like option, select TI & DD as bootable components, choose your CD Drive or ISO image place and then it beautifully gives you an error E00118000B: "Cannot load the required components. Please reinstall Acronis Bootable Media Builder. Error code 0x18000B". I was trying to contact your World Famous No Support At All. I could get paid support only, but this looks like a dysfunction of the program. Why would I pay for your problems. I have paid for your programs. I spent good while over your User Guide for DD 12. I do believe, it is unreadable. Person, who wrote it, is mixing 2 different concepts of building a rescue disc in such horrible way, that I never succeeded to understand how to build a rescue disc even for DD 12 on its own. I am a simple user. I use your program for partitioning & backup for over 10 years. The product should be programmed in such a way, that I do not have to spent my life trying to understand it. Here, Anna Trifonova is telling: "Acronis Disk Director 12 bootable media build can create bootable media only for Acronis Disk Director". So, why on the Earth, would you have a functional link with a wizard allowing you to configure the rescue disk the old fashioned way with TI 2015 & DD 12 together??? If I cannot build a Bootable Rescue Disk, your program is useless and you should not charge for it. And all your support is a No Support At All. You can spend hours to find it, and then it is only a paid support any way. Why did you worsened the functionality of your program so badly? I succeeded to make a bootable disk with DI 2015 only. But, I would like to have a Bootable Disk with DD 12 as well. And, what is so wrong on having a bootable disk with DD & TI together? With good 30 years of education and by being around computers from around 1980, I should be able to make it. Other way, I wouldn't mind to get your programs refunded. My four years older versions of DI & DD still work fine. Hey, I made it! I've got a Bootable Rescue Disk for Disk Director 12!!! Yuppie!!! Yep, all the problem is that the programmers are trying to confuse the enemy. Inside the wizard for DD 12 bootable disk builder, they give you an option to create a bootable disk for DI 2015 & DD 12 together, as I mentioned before. That's the catch. You have to be smart enough to understand that their program does not work the same way as before. Do not check the option for DI 2015, but only for DD 12 and you will end with a little bootable disk for Disk Director 12. If you would like to have a bootable disk for DI 2015, you have to make it from the wizard from DI program. It is so easy. Why I spent a day of my life over such a stupidity... Everybody knows that the programmers in Indonesian Jungle, who programmed DD do not have any way to communicate with the East Indian Kashmir programmers, who programmed Drive Image. They call it Global Economy. That's why we cannot have only one bootable disk, but we need two. Two is more than one! Hello, I am having the same problem withTrue Image 2016 (5586) and DD12 (3223). By using the media builder from TI, it includes both products, but DD12 shows as demo version !!!!!... Any comment anyone ?? D12 is indeed a license, I paid for it at the same time with my 3 licenses for TI2016. Isn't there anyone from Acronis to respon ? It's pathetic. I think next time, I'll look for some other software. I have had the same issue, using True Image 2017 + DD12. I tried using the Rescue Builder from both products, but I noticed outside of each folder on the menu there was also a 3rd Shortcut for Rescue Builder, and this worked. UniversalRestore.exe with a size of 5.40 MB (5,666,104) dated March 18,2016. I am not sure how to download this file as a standalone, as it came bundled with one of my updates, to which product I am not sure. I run DD12, ATIH2017 (had previous versions), as well as Acronis Drive Monitor. I replaced the shortcuts in all the menu folders to point to this one. It works fine, I have created several boot media without issue. Note: I used 8GB flash drives, and it said I had about 6GB free. I do pre-load Windows drivers for my LSI 9608 card, for Win 8.0 thru 10, both x86 and x64 versions. So that option also works, the previous version of the Rescue Builder would sometimes have problems pre-loading the MASS storage drivers. Note: I built a bootable USB thumbdrive with both but this should apply to a CD as well. I used True Image 2017 with Disk Director 12. 2) Run the wizard again but this time check BOTH TI and DD. This time it should work without error. Apparently the DD Only install sets up the boot portion correctly which is not wiped out on the second run with TI included. Thank you for sharing your solution with the community! I'd also suggest taking a look at the MVP Media Builder that supports the incorporation of multiple Acronis products into the same WinPE media (True Image, Universal Restore, Disk Director, Acronis Revive, Snap Deploy and Backup).